Cirencester, known as "The Capital of the Cotswolds" is situated in the county of Gloucestershire in England. Even though it is situated in the heart of the Cotswolds, it still enjoys a relatively central position, with London, to the East, only 90 minutes away via the M4 motorway, Birmingham to the North is 75 minutes away, and Cornwall only 2 hours down the M5. 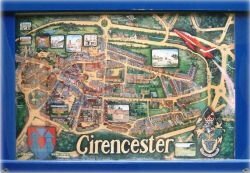 This page is the place to find various Cirencester facts and figures. Cirencester makes an idea base when visiting the Cotswolds with places such as Cheltenham, Oxford, South Cerney, Bibury and Burford within easy reach. Twin Town - Itzehoe, Germany. On October 8th 1982 a partnership between Cirencester and the German town of Itzehoe was celebrated in an official Twinning Ceremony in Itzehoe. Itzehoe is located at the west coast of Schleswig-Holstein, the northernmost land of the Federal Republic of Germany. Itzehoe is the "district town" of the Steinburg district and its population is approx. 34500. A modern business world shapes the face of the center of the city, surrounded by old and newly created populated areas which are partially framed by wooded areas. However, particularly in the past few years the landscape has changed because many businesses have chosen Itzehoe as their location, due to the easy access to transportation facilities and well designed traffic routes for commuters, as well as having the metropolitan city of Hamburg near by. Besides offices and producing trade businesses, areas like microelectronics and technical microsystems are increasingly gaining importance in this city. From the North Leave the M5 at junction 11a, and follow the A417 towards Cirencester. Cirencester's nearest railway station is at Kemble (around 5 miles from Cirencester) on the Cheltenham-Swindon-London line. Trains run to Stroud, Gloucester and Cheltenham (for the Midlands and North) and to Swindon (for London Paddington, Reading, Bath, Bristol and South Wales). There are also three through services each day to and from Paddington. The nearest major airport to Cirencester is found at Bristol (then follow "From the South" road directions, closely followed by Birmingham (then follow "From the North" road directions). The design, concept and content of the Cirencester web site is the intellectual property of Commatic Limited. No part of this web site, including images, graphics and text, may be re-produced or stored, in any manner, without permission.